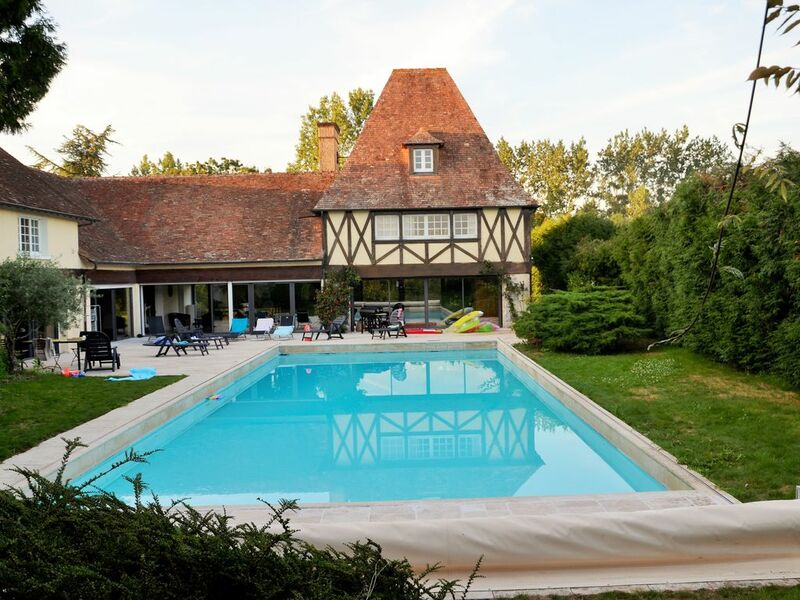 Close to the Châteaux de la Loire and two hours from Paris by motorway, we propose you the rental of a large house (300 m2) in the atypical style which is 15 minutes from Zoo de la Flèche and half an hour Of the 24 Hours of Le Mans. Garden, terrace 70 m2, pond. Rent canoes and horseback rides 10 min. American fridge, washer dryer, dishwasher, oven, gas hob, flat screen TV in the living room and in the bedroom on the ground floor. We are located in Durtal, in Anjou, Maine et Loire (49) at 2h30 from Paris, 30 minutes from Angers, 40 minutes from Le Mans and 5 minutes from the A11 motorway. In options on request and with a supplement: SPA (290 euros the week or 190 euros the week-end), the sheets and towels 10 euros per person and the household at the end of the stay - 80 euros. This home exceeded all our expectations. Our mouths dropped when we were shown around the house. It is a truly amazing, rural property. One of a kind. 7 of us (3 adults, 4 children aged 11 – 13) stayed here from 11.8.18-18.8.2018. We were blessed with glorious weather, so opted out of the spa facilities, but you can decide whether to use these, before or even during your stay. The owners are extremely flexible. The swimming pool and outdoor area was the jewel in the crown. The photos do not do it justice. Our children loved the deep swimming pool as it offered diving opportunities that most pools do not give. We didn’t find it dirty and it was cleaned daily by a pool robot. Ample sun beds, lovely wicker dining furniture and beautiful, clean patio area. It was very difficult to drag the children away from the house. The games room was fantastic – table tennis, table football, lots of board games, bar and fabulous seating area, so we could enjoy it as a family. There was also Netflix for family movies. The garden is huge. There’s a lovely walk through the garden to reach the river. We fished here and probably could have launched the canoe if we had taken it. We had an evening campfire and toasted marshmallows as the sun went down. Star spotting without light pollution. Perfect! There are 6 bedrooms. 3 of these have been renovated, two had en suite bathrooms. The other 3 bedrooms are to be renovated, but were still lovely, charming rooms. These shared a family bathroom, but this still worked fine for us. The owners are a very friendly, approachable family working hard to renovate this property fully. They were very quick to respond to any queries. The local town, Durtal, is approximately 5 minutes drive away. There’s a beautiful chateau, boulangerie, supermarket and Tourist Information Centre. We could not recommend this place highly enough and it must be seen to be believed. Would love to come back, perhaps in winter so we could enjoy using the huge dining room fire. We are so happy that you had such a great time in our house. It was a real pleasure to have you stay here and we really hope to see you again in the future!! Thank you very much for the more than lovely comment, you can't imagine how much we appreciate it! We'll continue to do our best to please our guests and we are very glad that it is noticed. Thank you for being so kind! We stayed for a week in this lovely property from 4/8/18-11/8/18. We were 2 families in a party of 8 which included 4 children aged 14, 13, 5 and 11 months. We were delayed at the euro tunnel for a while and then got slightly lost but the owner's family were easily contacted by telephone and were there to greet us at a later time than originally hoped for. We stayed during a bit of a heat wave so made full use of the large private pool and then ventured out to the surrounding areas when the weather was a little cooler. We visited La Fleche Zoo, The Le Mans Motor Museum and the Papea Parc theme park, which had something for everybody at a very reasonable cost. The house is set in a beautiful garden, just as described on the site. It is very spacious with large bedrooms, ample bathrooms and indoor and outdoor dining. We made use of the spa room, table tennis and football table. Wifi and Netflix was available too, but mostly we were outdoors. We would not hesitate to recommend this property to anybody wanting an away from it all holiday in France in a large varied age group. Thank you. The house is lovely and the owners very friendly. But...we were miffed with the £70 cleaning charge when we got there and opted to do this ourselves. The house is reasonably well equipped with the very basics but we were disappointed to find we had to provide what I would call basics- loo roll, kitchen paper, bin bags, dishwasher tablets etc. The kitchen had a fly problem with at least 20 appearing every day until we purchased a fly swot it really needs a wall mounted fly zapper thing. The kids toy area was very well equipped but we found cockroaches in some of the kids toys, didn’t bother us we just shook the little buggers out, it’s an old house in a rural location. The pool is fabulously deep, for adults, but we went with a 7,5,4&3 year old- all of whom can swim but were very unnerved by the high pool edge and there was no where that they could stand up in. A bar at the shallow end of the pool would be a really good safety feature and the cover needs fixing ASAP as the pool was quite dirty. the rooms were clean and those that hadnt been modernised had a lovely rustic French charm to them. The beds all seemed new(ish) and the linnen was lovely. Overall a lovely stay but defiantly some things I hope the owners can take on board. We are very glad that you enjoyed your overall stay, it is all that we wish for. Thank you for taking our efforts into account, even though you found some issues. First of all, the cleaning charge, which is 70 euros (and not 70 pounds), is a quite low prize considering what we do. The house is over 350 square meters, equiped with 5 bathrooms,5 WC, 6 bedrooms, and a big kitchen, bar, SPA(70 m2). We leave the possibility to do it yourself, since we understand that it might not be included in your budget, but if you decide to do that, we expect to at least vaccum the floors. Also, at the beginning of each stay we furnish the house with all that you might need: toilet paper, cleaning supplies, soap at every sink, capsules for the dishwasher, kitchen paper, bin bags everywhere. We simply can't furnish this even during the stay. For some what we leave is enough for the whole stay, but depending on your consommation you must arrange yourself to purchase everything you need for the rest of your stay. We are very sorry for any problems related to insects in the house, flies or cockroaches. The house is indeed in a very rural location and we have furnished it with all that we could think of. We didn't know that there was such a big fly problem, since whenever we're there, we don't seem to encounter it. But now that we know we'll do our best to fix it.Thank you for the fly zapper thing, i'm sure the next visitors will appreciate very much. As of the pool, it isn't the best for little kids with no inflatables, that's why we made sure to have an alternative such as the spa, where the jacuzzi is great for kids. But thank you for your recommandation, we're taking it into account and we'll make sure to put a bar at the shallow edge of the pool, so that it becomes more adapted for smaller kids. We do thank you for your comment! Comments as this one is what helps us improve our location and make it even better for future visitors. Réunir 6 adultes et 5 enfants de 8 ans à 1 an dans une propriété en pleine nature, avec de grands espaces à vivre, des chambres confortables avec de nombreuses salles de bain. Une maison de caractère, bien entretenue avec de grandes pièces à vivre, une grande hauteur sous plafond. Une grande terrasse entre la maison et la très grande piscine et un grand jaccuzi à l'intérieur de la maison. Nos enfants ont été bluffé ! Beau week-end en famille pour nos 50 ans de mariage. Una estancia genial, algunos detalles a mejorar. Alors une propriété magnifique, bien plus que ce que nous nous attendions. Piscine immense, jaccuzzi sauna au top Dy top sans compter l'espace au tour et le lac. Au niveau des intérieurs super grand de la place pour 16pers sans se sentir confinée afin de pouvoir fêter nos 25 ans mon amie et moi, pas de restrictions au niveau du bruit. Merci beaucoup! Nous avons eu le plaisir d'accueillir des clients aussi sympathiques, attentionnés et sincèrement heureux chez nous. Nous avons beaucoup aimé accueillir votre groupe et nous serions ravis d'accueillir une partie ou la totalité de votre groupe de retour dans l'avenir. Un dépôt de garantie de 1000 € vous sera demandé à votre arrivée. Il vous sera restitué lors de votre départ, déduction faite des éventuelles détériorations ou du coût de la remise en état des lieux. En option kit linge de lit et serviettes 10 euros par personne/séjour, ménage à la fin du séjour - 80 euros.